We are blessed because the support is coming in like "tsunami"! There are still some vacant slot available. Fill up the slots and let's enjoy the next regular meeting! Have you ever tried sharing about Toastmasters with your colleagues, family and friends ? Have you ever wonder if our experience in Toastmasters will hold up in a real Public setting ? Well something EXCITING IS HAPPENING THIS COMING SUNDAY ! Venue: MPH Bookstore, Mid Valley Megamall. D'Utama Toastmasters Club is proud to collaborate with MPH in celebrating "Power and Confidence in Public Speaking", for the general public. Watch 5 able and experienced members of D'Utama Toastmasters Club in action as they share secrets and tips on 5 different aspects of public speaking catered to working adults and the young as well. As a result of much exposure in work, speaking engagements and public speaking competitions, get ready for an entertaining and enlightening session with D'Utama Toastmasters Club, for the joy of public speaking! So avail yourself to join us this coming Sunday to support the first ever event between D'Utama Toastmasters Club and MPH Bookstore. Spread the word too, this is a great opportunity for you to share with your family and friends about Toastmasters !!! Once again we had our members representing Area B4 in the Division B contests. As President of the club I am proud of the the two members who gave their best and show their true grit. Eugene Ng (Intl Speech Contest) :Came in 2nd. G. Silvalingam (Table Topics Contest):Real tough one. D'utama TMC members would continue to bring out their best and enhance their speaking skill. Get there to witness Area B4 contests! Shah Alam TMC (10 March 2008)has ended. They will represent Area B4 at the Division B contest. The Area B4 International Speech And Table Topics Contest was held at the Shah Alam TMC on the 10th March 08. I am proud to announce that the winner for both of the contest are D' Utama toastmasters club members. Table Topics Contest Winner is G. Silvalingam, DTM!! International Speech Contest Winner is Eugene Ng, CC!! Venue: Women's Institute of Management (WIM) at Taman Tun Dr. Ismail. The winners deserved a round of applause. I have joined Toastmaster club for about two years. I like the most about the TM club is that every member have a chance to practice the skills they want to improve. I have tried out different role plays in the club’s meeting but this is the first time to be the contest chair of our club’s speech contest. I thought it is like TME at the first. But I realize that is more to do after being briefed by Calvin and I began to feel nervous. I need to get people to take part in the speech contest, I need to prepare the table topic questions, I need to understand the contest rule, I need to prepare the certificates and trophy etc. That are a lot of things need to be done and arrange before the contest. Fortunately, I received assistances from many members. We have nine contestants on that day to talk about the table topics question “Poor people are happier than rich people. Do you agree?” It is a very controversy issue but our contestants have delivered their view in a 2 minutes talk. Every one of them had given a very valid point from different perspectives. 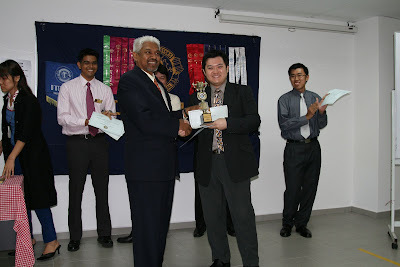 The Table Topic Speech Contest 2007/2008 champion goes to G.Siva, first runner is Hanzo Ng and second runner is Vijay B. The atmosphere of the contest speech is different from regular meeting just because I felt a sense of nervous and tension from the contestants and myself. Though I attended some speech contest before and how the flow should be, but I still very nervous because this is my first time to be a contest chair. I also felt the atmosphere kind of formal because I have to read out the contest rules and read out the same topic question in a routine and formal way for all contestants. I think it is a very good experience to be a contest chair. It is a better way to know the activity of Toastmaster. During the process of preparation, I got the chance to know and learn of handling different type of event because different type of event requires different type of preparation. I am very glad the speech contest was conducted and completed smoothly with the help of committed role players. I really appreciate for all the contestants and role players’ support to make this speech contest a successful content. At the end, I think I can quote from Confucius “I hear and I forget. I see and I remember. I do and I understand” to express my experience of holding the club speech contest. After conducted the speech contest, now I understand the difference between the contest chair and TME. We toast to the quick-witted & inspiring battle of year 2007/2008. Toastmaster has so much of toasting to do from days to years endlessly!!! Toastmaster has so many speaking practices to be done on the stage eternally!!! Congratulation! we are cowardly on the right track of finding and discovering ourselves ! Do join us at the coming club meeting, 6th March 2008, Thursday @ KDU, 7.30pm. The theme is "Find our Voices" which will help to replenish the inadequacies in every individual differently. We now have a team of vigorous volunteers gotten roles and slots filled. If you are not in 'this' lope; you will be our greatest enthusiasts & true assessors for all!!! Three days after the D'Utama Toastmasters International Speech Contest and I still cherish the experience I had as a contest chairperson. It was a personal success for me because I felt that this time round I did it better, much better! I would like to thank all role players who contributed to the smooth running of this important event. ASA1 Joanne Tham who handled the arriving members, contestants and guests with sweet smile, ASA2 Joey Wong who was so enthusiastic and helpful I thought I had a wonderful sidekick with me, Timekeepers Peter Yu and Teoh Chun Ming who kept track of the speakers allotted speaking time most carefully and Ballot Counters Ooi Li Ann and Karine Koh who diligently helped the chief judge to tabulate the contest results. You guys are genuinely committed members of D'Utama toastmasters club. Our club were never short of role players. In fact, all the role players turned up on time as promised. To the 5 contestants of the D'Utama Toastmasters International Speech Contest, you all have done a fabulous job in coming up with good and quality speeches. All contestants had clearly embraced the challenge of International Speech Contest so that they can feel the exhilaration of victory! By participating in a speech contest, a speaker enriches his or her speaking experience irregardless the speaker wins or not. To the winners, Eugene Ng, Vijay Balasegaram and Hanzo Ng, congratulations! What I realised was the role of a contest chairperson despite important, (i.e. can't run a contest without a contest chairperson) it is also relatively simple. To all members of D'Utama Toastmasters Club, if you have not experienced chairing a contest or a meeting, it is time to consider taking up the role when opportunity knocks. Who knows you might love the role more than I do! D'utama Toasmasters Club had just had our International Speech Contest 2007/2008 yesterday on the 28th March 2008. 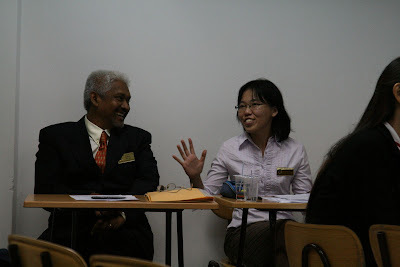 The Contest Chairperson was our very own dedicated Toastmaster Goh Sheen Yee. This time around she carried out the role remarkably well. The Contestants who took up the challenge displayed their true grit speaking on real life challenges and with passion. The winner Eugene Ng will represent D'utama TMC to contest in the Area B4 International Speech Contest held at Shah Alam Toastmasters Club on the 10th March 2008 at 7.00pm. I would like to introduce the members who volunteered to play role in the contest. They are the ones who ensured that the contest run on time and finish on time. Thank you and congratulations to all the contestants as you are truly the champions. Also to the members and guests who were there who make this contest a big success.